Since you’re already here reading about recumbent exercise bikes, it’s safe to assume you’re thinking about getting one yourself. That also probably means you’re aware of all the benefits such a piece of gym equipment has to offer. With all the available models, it can get a bit overwhelming; but today must be your lucky day because I’m here to guide you through the process of picking out the right one. The following list contains some of the best recumbent bikes available on the market right now – I’ve handpicked them for you. This one is widely considered to be a top model when it comes to Schwinn’s recumbent bikes, and I have to agree – it is my favorite, too. Even though the price is certainly high, this model seems worth of every dime spent on it. Comfort combined with safety is assured by simple things, like a Walk-Through design and a 300-pound weight limit. The seat, as one of the most important parts of a recumbent bike, is a combination of a padded seat and a mesh backrest (for added airflow) that provides lumbar support. But what makes it stand out are the added options. It comes equipped with two LCD monitors, which will allow you to monitor up to 13 different workout data charts simultaneously. The bike also offers you a choice of 29 different exercise programs. Once you’re done with your session, you can either download the gathered info (using a USB port or Bluetooth) or store the data on one of the four available user profiles. If you like to listen to music or watch something during your workout, this model has it covered, too. It comes with built-in speakers and an audio port. Even the simple accessories like water bottle holder and a fan for ventilation are included, which makes it hard to find something to complain about. 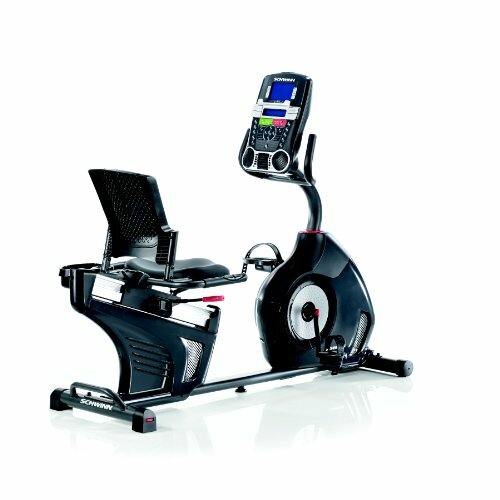 If my number one choice is a bit too much for your pocket, I’m offering you a great alternative – a recumbent bike made by the same trusted manufacturer. With this model, the price is somewhere in the mid-range. There are a few features that provide comfort, the most important one being the seat. Made entirely out of a mesh-structured plastic for airflow - it might not be ideal for some, but with its contoured leg area, I can’t say the manufacturer didn’t pay attention to comfort-related details. The Walk-Through design makes it easy to get on and off the bike. When it comes to all the additional gadgets, like its more expensive counterpart, this model has a lot to offer, starting with simple, comfort-oriented things like a three-speed fan to keep you cool. Also, an MP3 input and speakers for you to play music while you work out. 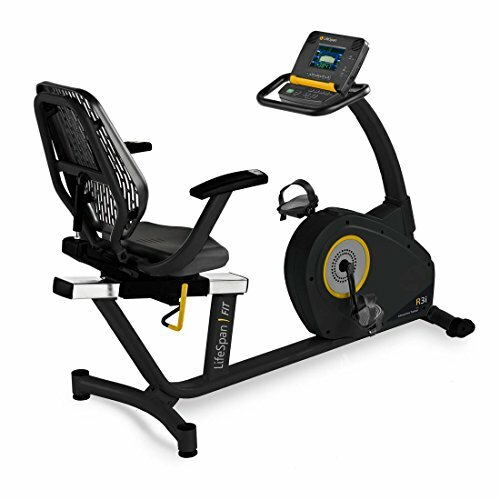 This model is equipped with two monitors, which allows you to track up to 13 different feedbacks about your workout. If you wish, you can then use the USB drive to export workout data to various fitness sites. It’s worth mentioning that it offers 20 levels of resistance and 22 different workout programs, which is by far the most versatility you’ll get in this price range. This recumbent bike model by Exerpeutic falls into the lower price range, which means two things. Firstly, a lower price doesn’t equal a lack of quality; it does, however, mean that the options and accessories on this bike will be basic and minimal. Secondly, it means that it’s a good choice for buyers with a smaller budget, that are still looking for an affordable, quality piece of gym equipment. When it comes to comfort, an oversized seat provides it to some extent, but some Amazon users have made remarks about it not being cushioned enough. The bike has a 300 pounds weight limit, which, when combined with the adjustable seat, means it can accommodate users of different sizes. It is sturdy enough to remain stable while you get on and off of it and the extended leg stabilizers only add to the stability, even during truly intensive workouts. As I’ve mentioned earlier, this model is a basic one – no bells and whistles. It comes with an LCD monitor that will show you the following workout data – distance, time, speed and heart rate (which is measured through the handles). However, it lacks other things; for example, a simple bottle holder would be a nice addition. It’s clear that the manufacturer focuses solely on giving you a solid exercise bike and nothing more. This LifeSpan model is one of the most expensive bikes on our list, so if you’re on a tight budget, you might want to skip to the next one. If, however, you can afford to spend this much on a piece of gym equipment, stick around to see what the R3i has to offer for the price. When it comes to comfort, the molded foam seat of the R3i hardly has any competition, and the backrest provides airflow since it has a mesh-like design. You can adjust both the seat as a whole and the backrest according to your personal needs. The weight limit of this recumbent bike goes up to 400 pounds, so it’s safe to say that it will work well for users of all sizes and remain stable. Now we get to the fun part – the additional options this model has to offer. The LCD screen will show you your workout data – distance, time, speed, heart rate, resistance level, calories burned and even date and time and the program name. All your workout info can be stored on the bike’s USB storage device or uploaded to the LifeSpan Club – you get a free membership when you purchase this bike. I’ve mentioned different programs – the R3i offers seventeen different preset workout plans, two heart rate training plans and two plans you can design yourself. This Sunny Health & Fitness model is a simple, yet reliable piece of gym equipment that won’t cost you much. 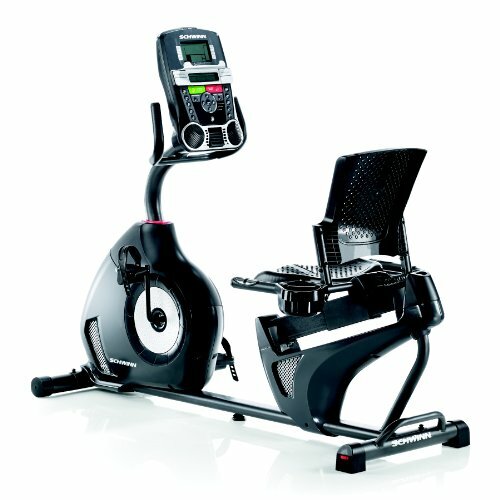 I would like to say that, in my opinion, this can be a great exercise bike for a beginner or someone who doesn’t care much about all the fancy additions other models have. When it comes to comfort, the manufacturer promises a wide, cushioned seat. That, however, is not the case – Amazon users have complained about the seat not being comfortable enough. That is disappointing since comfort is a huge part of why people decide on buying a recumbent rather than an upright bike in the first place. But there is one advantage worth mentioning – the seat can be adjusted manually without the need of getting up; the handle that allows it is a unique design feature of this manufacturer. As I’ve said earlier, this is a rather simple model. It is equipped with a digital monitor where you can keep track of your workout data – time, speed, distance, calories, and heart rate (the handles act as a pulse monitor, too). Also worth mentioning is that the resistance level is manually set by turning a knob. That’s pretty much it – simple and sturdy, with a weight limit of 300 pounds, this budget-friendly recumbent bike could be a good choice if you’re just entering the world of exercise bikes. 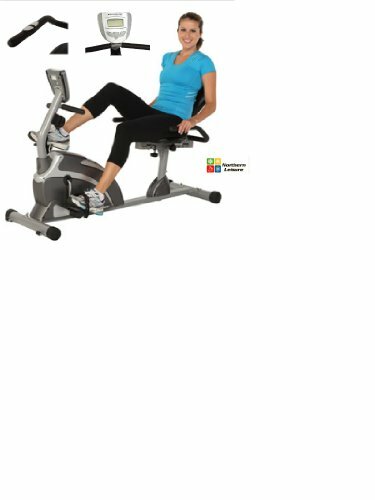 This type of exercise bikes has been around for much longer than the recumbent one, and they have earned their place among the favored pieces of gym equipment. One significant advantage they have over the recumbent bike is the price - they are usually less expensive, so they might be a better choice for those on a tight budget. Another one is the space they take up. A lot of upright bike models can even be folded for more efficient storage, which is always a plus. When comparing a Recumbent to an Upright Bike, the first difference is the level of comfort. If you’re anything like me, you like to stay comfortable while burning some calories - this is where a Recumbent Bike comes to play. Because of the way it’s designed, it provides a quality workout while simultaneously keeping you in a state of relaxation. The design features that allow this are the chair-like seat of the bike, the reclined position in which your body stays during the workout, and the fact that there’s no need to hold on to the handles. To make things even better, the lack of handles gives you the freedom to do something else, for example, read a book or play a game – all while exercising. Since recumbent cycling is a form of cardiovascular exercise, it helps to make your heart and lungs stronger, which improves body’s ability to use oxygen. This form of exercise will also aid in lowering your blood pressure if incorporated into a daily routine. And finally, as a workout that engages large muscle groups, recumbent cycling builds strength and burn fat. And, you can combine with running exercise or walking exercise﻿﻿ to get bette﻿r. 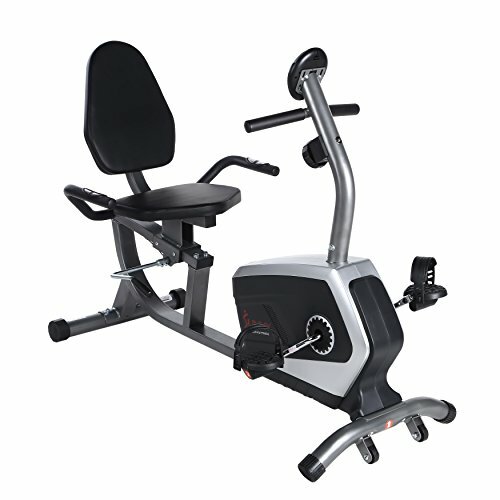 Because of the larger seat, back rest and a reclining position, this type of exercise bikes are considered to be more comfortable than their upright counterparts. Also, when you’re using the recumbent bike, you’re seated much lower to the ground and can’t stand up on the pedals, which lessens the chances of an injury during your workout session. When you’re using a recumbent bike, you’re sitting in a relaxed position, with your legs in front of you, rather than hunched over as you would be on an upright bike. That means your knees, hips and your spine are put under a lot less stress; this is ideal for people who already deal with joint and back pains. The low impact nature of this type of exercise bikes makes them great for not only people who are new to cycling as a form of exercise but also for those who have suffered injuries that prevent them from performing other cardiovascular workouts. As your fitness level progresses, you can adjust the resistance on the bike to further challenge yourself. It is good to build muscles of your front legs and back legs. Since there are a lot of recumbent bike models available on the market right now, it might be hard to choose the right one even for someone who isn’t new to the world of fitness. And for a beginner, it’s probably unbelievably confusing. To make your choice easier, I’ve decided to give you a list of things you should consider if you want to buy a recumbent exercise bike. It would be great if you could just pick out the model you like without considering the price, but let’s face it, most of us need to take this into account. Since comfort is one of the main reasons you’d opt for a recumbent bike instead of an upright one, it makes sense that this will be one of the features to pay attention to when making the decision. Look for contoured, padded, adjustable seats, as they are proved to be the most comfortable ones. Make sure the bike you’re buying has a well-built frame and is stable – I cannot stress enough how important this is. That is what will keep you safe during your workout sessions. Also, in case you’re not what’s considered an “average size,” take the weight limit into account, as it will affect both comfort and stability of the bike during your workout. Every exercise bike comes with an interface that will give you the most basic information about your workout, for example, your stats and the resistance level. But there are always some added options, too. My advice to you is to use these optional accessories and gadgets as a way to choose the most suitable recumbent bike for yourself if you’re stuck deciding between a couple of models. As you’ve seen, there truly is a lot of models available on the market, with prices ranging from less than $200 to more than $1000. Hopefully, this buying guide I’ve assembled will help you make the final choice. And speaking of choices, mine was the Schwinn 270 Recumbent Bike. Why? Mostly because to me, it seems to offer the best relation of quality and price. It is a sturdy piece of equipment with all the added gadgets for a workout that is as pleasant as possible. Most of the models on this list just can’t compare with the versatility of programs and resistance levels of the Schwinn 270. My alternative pick, the Schwinn MY16 230 Recumbent Bike, does come close, though.